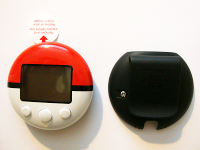 This is a Used PokeWalker originally from a HeartGold or SoulSilver bundle. Batteries are not included, but they are tested and working. May have some minor wear and light scratches. 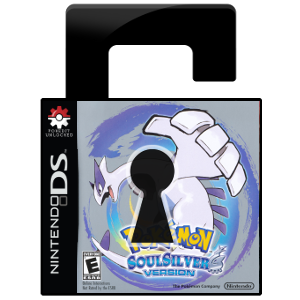 Uses a currency known as "watts"
This is the clip cover for the Pokewalker accessory that was included with Pokemon HeartGold and Pokemon SoulSilver. It includes the screw used to attach it to the back of the Pokewalker. 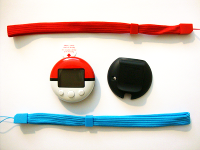 The Pokewalker is a Poke Ball-shaped pedometer which can connect to Pokemon HeartGold and SoulSilver game cards via infrared signals. 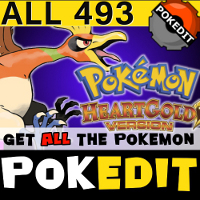 The player can transfer a Pokemon to the Pokewalker from either HeartGold or SoulSilver. Every time the player takes a step, the Pokemon inside gains experience points and the player earns "Watts", a type of in-game currency which was also used on the Pokemon Pikachu virtual pet. Players can also catch various Pokemon on the device and obtain items, then transfer them to the game. The device comes bundled with the games. When players transfer a Pokemon from their game into their Pokewalker, they can select which route they would like to take their Pokemon along. Depending on which route the player takes (such as in a grassland or by the sea), they will encounter different wild Pokemon and items. 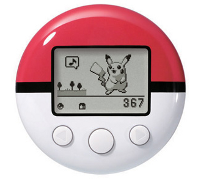 When players first begin their journeys with the Pokewalker, the list of routes they can select from is short. But, the more players take a stroll with their Pokemon, the more routes will appear and the more Pokemon and items they will be able to get. 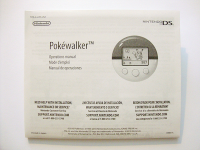 One criticism of the pokewalker is the ease of "cheating" or "hacking" in which players will intentionally create artificial situations mimicking walking. This has consequently led to multiple varieties of Pokewalker cheats causing Pokemon to gain experience without the user actually expending any effort. Nevertheless, the device has still been praised as a good way to get kids active and to have fun at the same time.